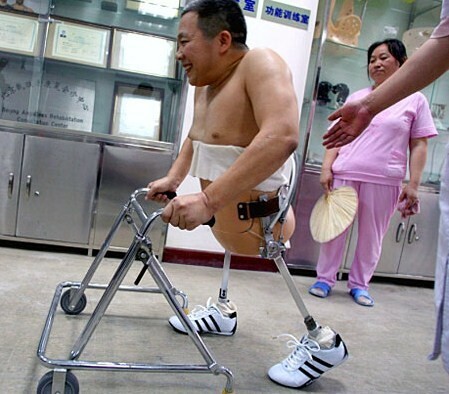 He survived against all the odds; now Peng Shulin has astounded doctors by learning to walk again.When his body was cut in two by a lorry in 1995, it was little short of a Medical miracle that he lived. It took a team of nearly 20 doctors to save his life. 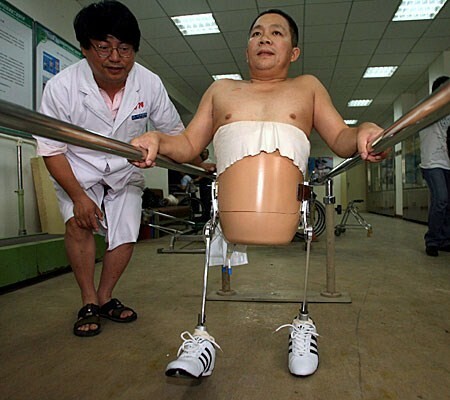 Skin was grafted from his head to seal his torso – but the legless Mr Peng was left only 78cm (2ft 6in) tall. Bedridden for years, doctors in China had little hope that he would ever be able to live anything like a normal life again. I know what you are thinking now, “Well Mr Robin Bal, what’s all this got to do with Personal Finance, Investing, Debt Elimination etc.” A LOT, go on continue reading, get the message. But recently, he began exercising his arms, building up the strength to carry out everyday chores such as washing his face and brushing his teeth. Doctors at the China Rehabilitation Research Centre in Beijing found out about Mr Peng’s plight late last year and devised a plan to get him up walking again. They came up with an ingenious way to allow him to walk on his own, creating a sophisticated egg cup-like casing to hold his body with two bionic legs attached to it. He has been taking his first steps around the center with the aid of his specially adapted legs and a resized walking frame. Mr Peng, who has to learn how to walk again, is said to be delighted with the device. Call it Self Confidence, Determination, Personal Development, Goal Achievement or whatever, all these have a lot to do with all departments of your life, leave alone Finances. Hi, i feel that i saw you visited my weblog thus i came to ?return the desire?.I’m attempting to find things to enhance my website!I suppose its ok to make use of a few of your ideas! !